In 1989 when we started Friends of the Crooked River, we made a list of 19 things we could work on to support the Cuyahoga River. Out of that list came RiverDay and much of our early efforts. Included on the list was “Breaking Down the Gorge Dam.” It was added almost whimsically. None of us believed we would see it happen. Now we are on the precipice seeing that useless hunk of concrete tumble into history. Beginning in the mid 1990’s, we were involved in middle Cuyahoga River issues. 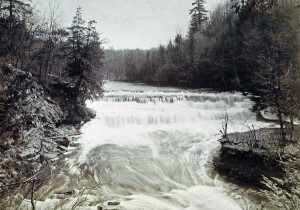 Contention had been brewing between communities downstream of the Lake Rockwell dam and the City of Akron over lack of water and its benefits, including healthy fish and other aquatic populations. This led to a lawsuit which was resolved years later in the Supreme Court of Ohio. 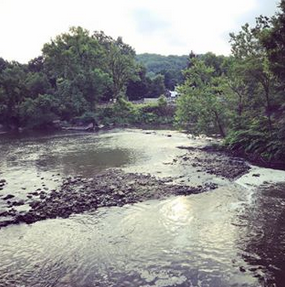 During that time, the City of Akron began plans to divert an additional 5 million gallons a day from the Cuyahoga watershed, a subwatershed of the Great Lakes that required international consent. Also at that time, the Ohio EPA conducted a study to determine the sources and causes of nonattainment of aquatic health in this section of River. We were involved in all of issues. Through our work with several national organizations, we helped make the diversion issue a national concern. During these years, what became crystal clear to us is that dams were the major culprit in the middle Cuyahoga’s woes. Ohio EPA called for feasibility studies to remove the Kent and Munroe Falls dams. We became dam busters. For eight years, we worked shoulder to shoulder with many stakeholders to support the modification of the Kent dam and removal of Munroe Falls dam. On RiverDay, 2005, our joint efforts were rewarded in a spectacular design and a free-flowing River in Kent. In October 2006, Brust Park was dedicated at the site of the demolished Munroe Falls dam. And the dominos headed downstream to Cuyahoga Falls. There we worked with the City. In the summer of 1913, two dams fell there. In 2003, a private company applied to the Federal Energy Regulatory Commission for a permit to produce hydroelectric power at the Gorge Dam. Summit Metroparks opposed the action. Friends of the Crooked River jumped in. For six years, we waged a public relations campaign while Metroparks worked the courts. Favorable court decisions led to the end game. The company backed out in 2009. At last, the dam was effectively obsolete. For a summary of this permit, click here. To view our work on this issue, click here. 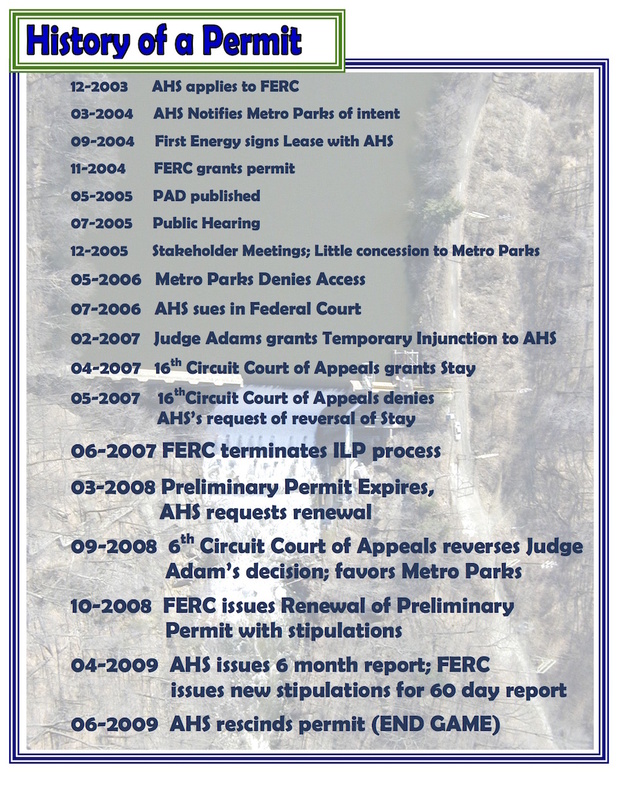 Since then, we have supported the efforts of Ohio EPA to take down the Big Dam, in the same way we have assisted in the other dams, by holding meetings, drafting and distributing materials, conducting community outreach, attending gatherings of potential supporters, soliciting support of public officials, and overall making noise. We have been a keeper of the dream and a bearer of the light for a free flowing Cuyahoga River. For an up-close-and-personal presentation on the Dams of the Cuyahoga and Friends of the Crooked River’s work, schedule a presentation for your class, group or organization. Contact us.